ArtSake had the good fortune to meet Anne Krinsky at the recent Get Your Grant lecture at the Concord Art Association. She’s an artist who is extremely adept with both painting and drawing and as you’ll see, her line work is exquisite. We asked her if she would share with us a little bit about her working process. 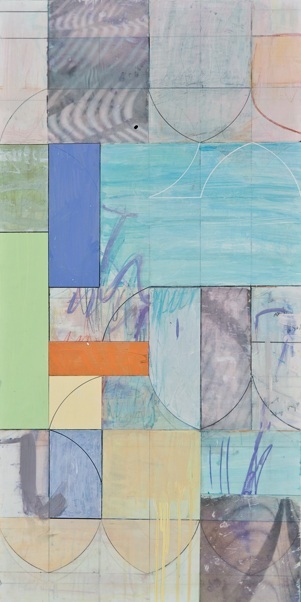 For my second show at Soprafina Gallery in Boston, Anne Krinsky: A Provisional Space, New Works on Panel and Mylar, I am exhibiting architecturally-inspired abstractions, informed by my residency last September at the Rocky Neck Art Colony in Gloucester, MA, and by a recent trip to Tunisia. 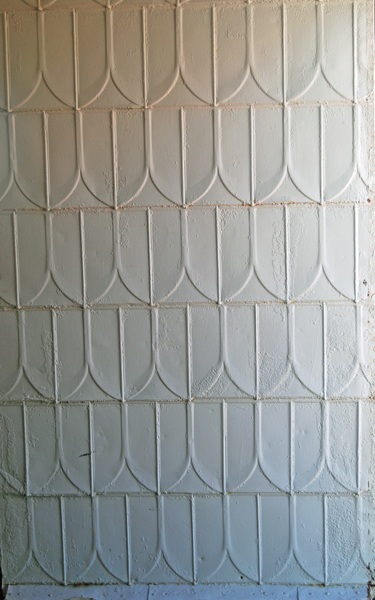 The large carriage door of the Rocky Neck residency studio is sheathed in an embossed, gridded pattern that resembles a boat’s hull – or, when inverted – doors, gothic windows and archways. 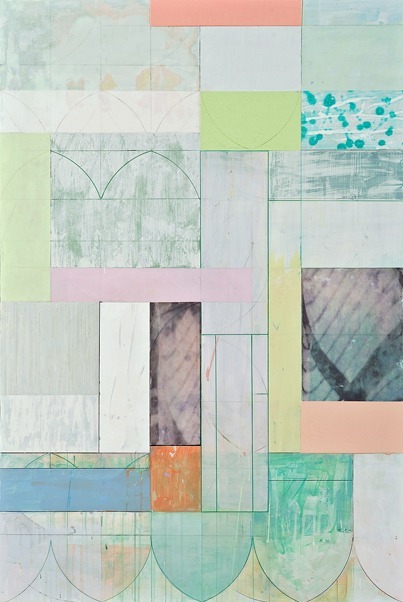 I have used grids in my work for many years and shortly after I arrived on Rocky Neck to begin my residency, this one announced itself as “my next grid.” Using this grid as a scaffold, I have created luminous acrylic and mixed-media works on panel and on layered Mylar. 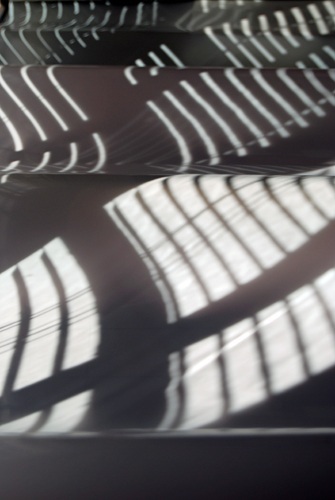 While I was at Rocky Neck, I took some photos of light coming in through the studio blinds and falling onto rolls of Mylar I had placed on a table top. By manipulating the Mylar scrolls, I could shape the light patterns into a variety of wavelike forms. I then incorporated acrylic transfers, made from these photographs of light patterns, into other works on panel and on Mylar. My observations from Tunisia also animate this body of work. I integrate forms originating in Tunisian vernacular architecture – complex tiled interiors and white exterior walls punctuated by brilliant blue windows and doors – into my gridded framework. I sometimes think that all my work is just an excuse to mix colors. I work with geometric and botanical forms – Chinese and Islamic architectures, field guides and my own drawings of plants. 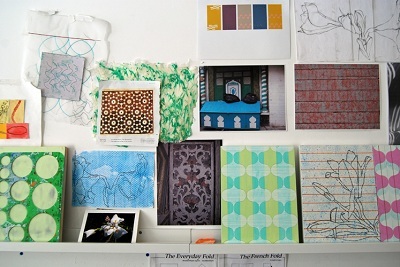 I think of my studio as a repository of images – which can be recycled and recombined in novel ways. My Shelf Life installation is one result of this visual cross-fertilization. 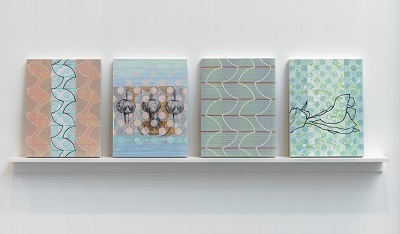 I made Shelf Life, a site-specific installation of small panels, displayed on shelves, for my 2010 show, Anne Krinsky: Time/Line, 2000-2010, at the Trustman Art Gallery at Simmons College in Boston. 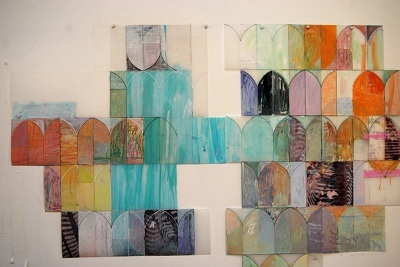 Some of the panels had been hanging around my studio for years and had been sanded down and reworked. These included botanical images from 2002 and 2003, which I made after seeing rare illustrated manuscripts in London’s Natural History Museum. The composite work – in which green stripes figure prominently – was inspired in part by the subtly striped green glass of the new Simmons library. I also will be exhibiting other small panels from the Shelf Life series at Soprafina. hope to make it tonight. your work is so wonderful. I’d love to hear even more and see it especially. and see you especially too. I was at your Simmons lecture but didn’t recall you mentioning the patterns from light. It’s great the way you layer patterns and structures from such diverse sources and integrate them so well. Wonderful exhibit. They all work together nicely and several cause you linger and absorb them. I will get by the gallery to see the new work soon! Congratulations! I really like the new direction of this work. 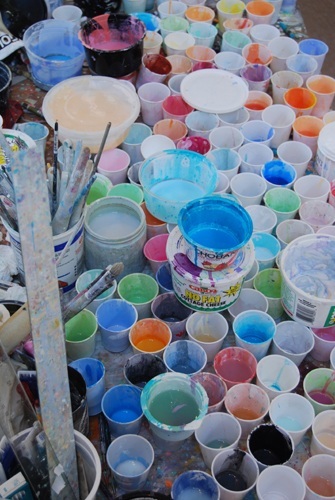 As I scroll down on these pages, I was very moved by your use of colors (exactly like Quatrale’s comment– they draw me in and linger) …then, I read your words: “I sometimes think that all my work is just an excuse to mix colors.” and I smiled to see the buckets you use… Sorry to miss your exhibition! I am sure seeing the real work will be a even better visual experience.